Hi, I’m interested in HP ProBook 450 G3 Core i3-6100U with Intel HD Graphics 520, 8GB Ram . Please contact me. Thanks! HP lt4110 LTE/HSPA+ 4G Mobile Broadband. Intel Dual Band Wireless-AC 8260 802.11a/b/g/n/ac (2x2) Wi-Fi and Bluetooth 4.2 Combo. 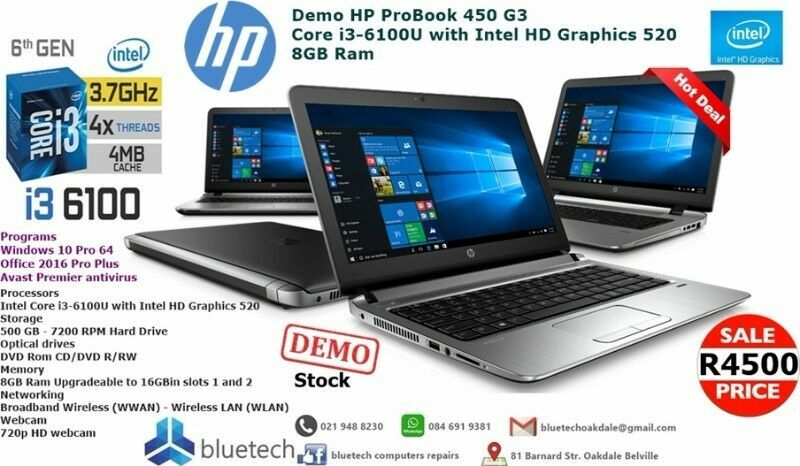 HP Probook 470 – G3 + Dual Graphics + HD Audio + DDR4 + 6 Hour Battery + 12 Month Warranty. Hp Elitebook 840 – G4 + Dual Hard drives + SSD Drive + LTe + Bang & Olufsen Audio. Current Retail: R18,125.00 (Base Model, ex Software, SSD, LTE and more) Contact is for verification link.